Thala Ajith’s much expected ‘Vivegam’ teaser did not release on May 1, 2017 as promised earlier. Thala fans had to celebrate their matinee idol’s birthday with the second look posters released by the makers on that day. 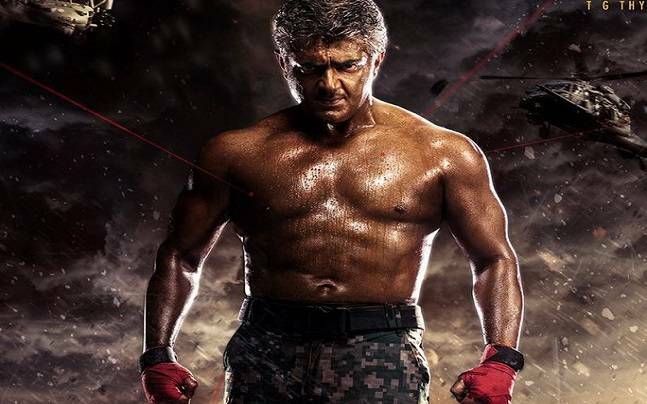 .Now the film’s director Siva has confirmed that the teaser of ‘Vivegam’ will be released on May 18, 2017 as speculated earlier. The date falls on a Thursday which is compliance with the Thursday sentiment followed by Siva as well as Ajith in all the three films they have worked so far. ‘Vivegam’ is an spy thriller touted to be the costliest film of Ajith ever. The film has been produced by the prestigious Sathya Jyothi Movies banner. Kajal Aggarwal plays the female lead opposite Ajith while Bollywood star Vivek Oberoi is the villain of the film. The film is expected to hit the screens in the month of August.